We imagine, build and light great New York spaces. Interior and lighting designer Gregory A. Roach assembles and leads design and construction teams that win occasional awards and have gathered decades of editorial notice. Based in New York City, he offers a reliable and cost effective interior design renovation program referred by some of New York’s best real estate professionals. My team and I provided all services for a complete interior design and renovation of this prewar UpperWestSide classic, including original woodwork and plaster restoration, period antique lighting, his and her home offices, color selection, excellent millwork and fabrics, glamorous stone and luxury bathrooms. This 5,800 square foot loft offers near limitless space to an active family of four. I designed a large, central kitchen with a curving breakfast bar to serve as the hub of their home. Our builders installed custom white lacquer and Sapele wood cabinets with first-rate, stainless steel appliances. We added long counters in polished white quartz to frame a butcherblock island, and a stand-alone bar with electrical service to host homework and digital charging. My team renovated the entire floor, adding windows and roof mounted AC. We preserved all historic features of this circa 1900 property while supporting their 21st century lifestyle. While the owner travelled half a world away my team and I swaddled this three bedroom, two and one-half bath high above the WinterGarden in a rich, smokey palette of Jacobean oak, stately crown moldings, statuary marble, stainless steel and custom eggplant tilework. Incorporating efficient LED lighting and a sliding, frosted-glass partition, this condo was move-in ready for the day they returned. A narrow kitchen in the Village had little storage and the electrical service was from the 1920’s. The owner asked for a display of her Asian artifacts, too, and there was a dilapidated fireplace to salvage and modernize. We opted for handsome, eco-friendly bamboo cabinets in the living room to extend the kitchen storage, then topped them with glossy, seafoam quartzite counters. Internally lit niches flank the volcanic, basalt fireplace. Liebherr, Miele and Viking appliances on new electrical service tucked into this little, compact kitchen very nicely. Manolo Blahnik asked us to analyze the display lighting in their shop and to bring their artistic footwear to better light. We specified and installed 30 new fixtures on four dimmer control circuits in efficient LED for a dramatic display with excellent color rendering. Working within extreme time constraints we installed and wired, replastered, painted and focused over a three-day weekend. Chile pepper red paint, rattan and brushed bronze detailing are set off by lighting concealed within custom, site-built, mahogany millwork. The data and electrical wiring required chopping into the walls for this masculine home office and library, but the result is a thoughtful blend of digital tech and prewar elegance. First, we created floor space by swapping in a neo-shower for the tub, then building bath linen storage where none had been before. The wall mounted, walnut vanity and the glass shower surround were custom made for this compact space, but the rest of the materials were right off the shelf. With a dark, dramatic tile and spacious mirror walls, this bath is good evidence that a well-appointed feel doesn’t have to estimate that way. New construction offers a blank slate for lighting designers. Working with local electricians, I specified a broad range of stock and custom lighting fixtures to display computer controlled scenes and effects at the touch of a button. 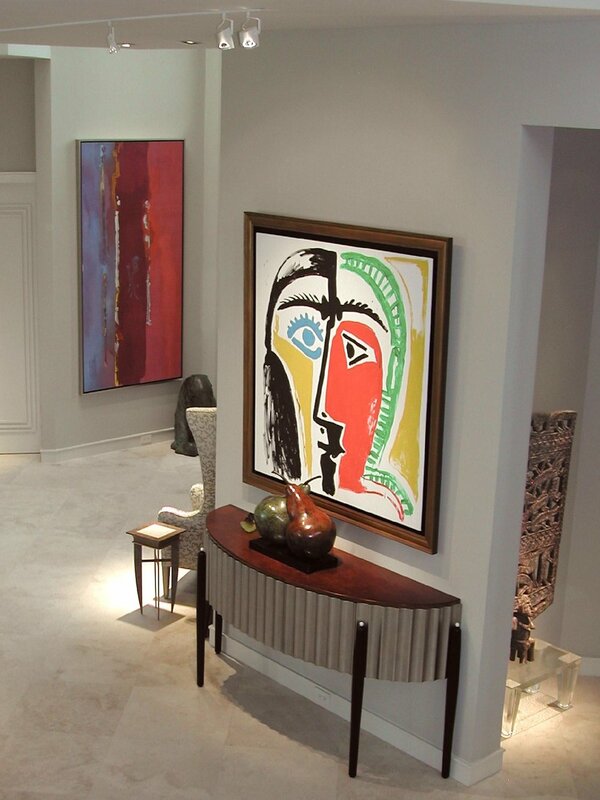 I personally focused and set light levels for the owner and their art curator for dazzling dinner parties and a showcase of works by Picasso, Warhol, Motherwell and Fernando Botero. After designing a large wrapping porch and living room-fireplace addition for this house some 20 years ago, we recently updated a bathroom. The floor slopes curbless under the shower so the wall mounted vanity and toilet reveals a Calacatta marble floor. We added excellent stock, wall mounted cabinetry, custom tile niches and glasswork lit by a mix of natural skylight, incandescent and efficient LED, on polished chrome fixturing. Sometimes a design doesn’t gather traction until the star material turns up. That’s what happened here for this upstate getaway; we found the pink onyx and the rest of this two person bath design fell into place. We moved some walls around, added skylights and then fitted the interior with white Thassos marble, two custom white lacquer vanities, concealed storage, polished nickel hardware and lots of mirror. The Industrial Revolution was inspiration for this New York pied-à-terre. We salvaged and reconditioned the century old bathtub, original bath tile floor and kitchen metalwork, then stripped paint to reveal raw metal wherever we could. A feeling of enhanced spaciousness is accomplished by extending the oak-strip, hardwood floor into the kitchen then refinishing to a sunbleached, factory look. Rusting steel details, rugged hardware, concrete tile and period fixtures burning Edison lightbulbs help complete the illusion of going back into time.